Russia’s government-owned Khabarovsk Airlines has decided to take one more L-410UVP-E20 aircraft on lease, its fourth of the type. The carrier will announce its leasing company of choice on December 21. This is going to be the only Russian contract for the 19-seat aircraft this year. The Czech OEM Aircraft Industries, which is owned by Russia’s Ural Mining & Metallurgical Company (UMMC), has recently run into nearly flatline interest in its product from Russian customers, mainly due to the latest fluctuations inRussia’s national currency. Khabarovsk Airlines’ deal will involve a 121-month finance lease contract for aircraft S.N.3010, built in 2015 and powered by a pair of GE Aviation H80-200 engines. The turboprop is priced at 406 million rubles (around $5.9 million at the current exchange rate), which amounts to 51% of the total lease contract sum. The operator hopes to take advantage of the Russian government’s commitment to subsidizing aircraft lease payments, which might entitle it to a compensation from the federal budget to the tune of 92.4 million rubles (12% of the contractual sum). Khabarovsk’s first three L-410UVP-E20s, delivered in 2013-2014, were priced at around 185.5 million rubles per unit. 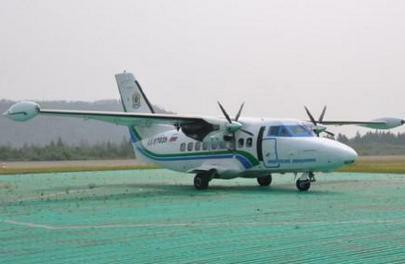 These aircraft currently serve three regular routes within a 1,000 km radius of Khabarovsk. At the end of 2015, Aircraft Industries will have delivered eight of its turboprops to customers. Five aircraft have already been handed over to their respective operators, and three more are expecting delivery to South Africa, the Sergey Martynov, the manufacturer’s sales director for Russia and the CIS, told Russian Aviation Insider. In January 2016, two more L-410s will be delivered to Russian clients. Contracts have also been placed for seven aircraft to be delivered to Indian and African customers in the first quarter of 2016. “Our preliminary sales forecast for 2016 stands at 18-20 aircraft, which is a fine result for our enterprise,” Martynov says. Next year’s production slots are mostly sold out, and Aircraft Industries is already taking orders for 2017. Back in 2014, Russia was the major market for the Czech manufacturer: seven out of its 16 aircraft were sold to Russian customers, who now operate a total of 38 L-410s. Despite the fact that Russian sales have taken a plunge, the global situation is improving, and “sales in the rest of the world are as usual, with growing interest in Asia, Africa, and South America”, Martynov points out. These growing markets should compensate for the temporary lack of sales in Russia, he adds.